The cabinets and the walls are aspects of kitchen design that stand out the most. The colors of these areas give personality to the room and will communicate your taste to visitors. Selecting the colors of the kitchen cabinets and walls is one of the most fun steps in designing a kitchen. While planning your kitchen upgrade or remodel, be sure to also check out our blog post How to Layout an Efficient Kitchen for tips on designing a kitchen that works for you. Two Tone Kitchens – In two tone kitchens, the top and bottom kitchen cabinets are different colors. This simplistic design breaks up the room and is pleasing to the eye. In this kitchen, the top cabinets are a light color while the bottom cabinets are a dark color. The backsplash matches the top color, creating a smooth transition. The hardware is minimalistic, which allows the color to stand out. Below, the top cabinets are white and the bottom cabinets are a dark color. In between, there’s a simple and metallic backsplash. These colors create the perfect backdrop for the rustic kitchen furniture in the room. The colors in this kitchen set the stage for a luxurious experience. The cabinets and the kitchen island are white with a gold trim that complements the marble counter top and backsplash. The result is a very elegant room with the combination of the marble and the white kitchen cabinets. These kitchens feature more daring and playful colors. Here, the top cabinets feature a blue/green color while the bottom cabinets feature a simple finished wood. The brick backsplash is subtle and allows the green to pop without distraction. 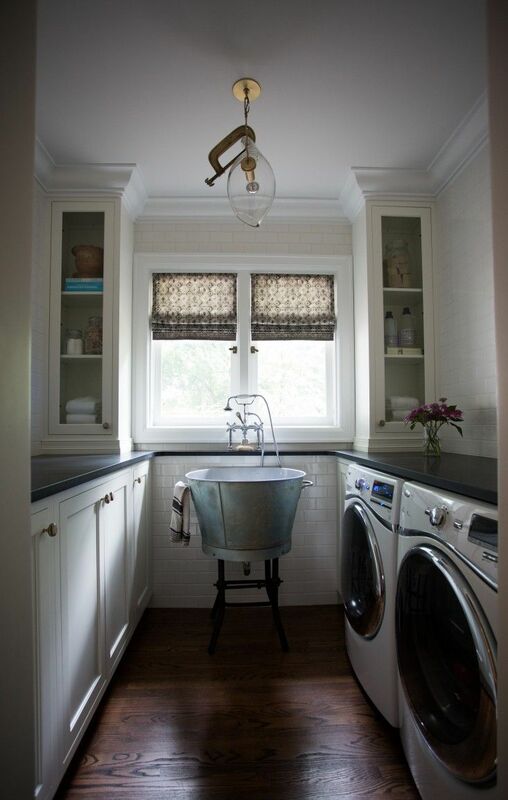 The task lighting underneath the top cabinets also help open up the room. In this second colorful kitchen, the cabinets, wall and tile flooring are all a relaxing shade of blue that creates a peaceful color scheme. This is perfect for a family kitchen where meals are prepared and memories are made. This example shows how color can be used to make certain areas pop. In this case, the trim at the bottom of the cabinets is yellow and so is the kitchen backsplash. However, the doors of the cabinets are actually white. In our last example of a colorful kitchen, you can see how different shades of the same color can be used to create depth. Here, the blue cabinets are a lighter shade of blue than the kitchen island. As a result, the island pops. In this design, you can see how color works in an industrial kitchen style. The wooden cabinets are accented with rivets while the backsplash is a simple white color. The cabinet doors and the range hood exterior are the focal points of this kitchen design. Other areas of color to pay attention to in the kitchen include the appliances, backsplash, counter top, island, flooring and hardware. All of these will coordinate together with the cabinets and the walls. This entry was posted in Home Improvement, Kitchen Design, Range Hoods and tagged color, Countertop, design, furniture, home design, home improvement, instagram, kitchen, Kitchen cabinet, kitchen design, range hoods inc, The Home Depot on August 4, 2015 by editor. This guest post is written by Jason Fowler, Pre-Construction Manager at Sea Island Builders. A green kitchen is no longer a luxury that you can only fantasize about; with a wide variety of earth-friendly products now available, it is easy and affordable to have the eco-conscious kitchen you crave. No matter your style or budget, consider these tips below to inspire a green kitchen renovation that will leave your conscience and your sense of style satisfied. 1. Choose sustainable kitchen cabinets. It’s easy to choose kitchen cabinets that are good for the environment, as well as your health. Simply select cabinets that are certified by the Forest Stewardship Council. These are all produced using sustainable forest management practices. They also feature formaldehyde-free glues, as well as finishes with low volatile organic compounds. These benefit your home environment, on top of the global one, by giving off little to no toxic fumes. 2. Keep your countertops green. There are wide varieties of surfaces available to keep your kitchen both sustainable and stylish. Many manufacturers make countertops that are made from recycled or sustainable materials, ranging from recycled paper, to renewable bamboo fiber, reclaimed wood from older buildings, or recycled glass. These countertops are also safer for your family, as they use low toxicity binders, such as water-based resin glue. 3. Look for Energy-Star rated appliances. The Energy-Star rating is only given to the most energy-efficient model of a given appliance category, making your search for green appliances a breeze. It’s possible to save more than $120 a year on just your refrigerator if you replace a twenty-year old one with a new Energy-Star rated one. In addition to the energy savings, many states and regional utilities will offer rebates for purchasing Energy-Star rated appliances. 4. Use an under-the-counter water purifier. With ten times the filtering capacity of a faucet-mounted purifier, an under-the-counter water purifier is the smart way to provide healthy water for your home. A carbon filter can remove heavy metals, pesticides, bacteria, unwanted tastes, and bad odors. The amount you save on water bottles and pre-packaged drinks will add up more quickly than you could believe. 5. Consider energy-efficient and natural lighting. Replacing your incandescent lighting can have a massive impact on your kitchen’s energy usage; fluorescent and compact fluorescent lights can use up to 90% less energy. LED lighting and energy efficient halogens are also unique, useful options – especially when lighting an area commonly used for detailed tasks. Also, work with the natural lighting options your home’s layout will allow. A few additional windows can flood your kitchen with sunlight, reducing your need for electric lighting all-around. With these five simple ideas, you can begin to design a green renovation for your kitchen that will save you money, as well as save the environment. You no longer have to sacrifice style, originality, or your budget to set up your kitchen to be sustainable, renewable, and non-toxic. The vibrancy of a green kitchen is sure to inspire health, wellness, and simplicity in other areas of your home and life as well. Jason Fowler is Pre-Construction Manager at Sea Island Builders, Charleston’s premier custom home builder and contractor. The company is dedicated to renovating and building custom homes that are energy-efficient and support the health and wellness of the client, the community, and our environment. Sea Island Builders is a partner of ENERGY STAR, the Indoor airPLUS program, and the EPA’s WaterSense Program, and a Lead-Safe Epa Certified firm. Learn more at SeaIslandBuilders.com or connect with us on Houzz, Facebook, or Instagram. This entry was posted in Home Improvement, Kitchen Design, Kitchen Tech and tagged Countertop, Energy-Star, Environmentally friendly, Forest Stewardship Council, instagram, kitchen, LED lamp, Volatile organic compound on October 13, 2014 by editor. The following five interior designers are active and popular on Instagram. All of these design professionals offer something unique and significant through their skilled designs, craftsmanship and their effective social media presence. Before reading on, don’t forget to check out our last blog post in this series: 5 Interior Designers to Follow. Insidestylehome (@insidestyle) – Inside Style is a design firm located in Las Vegas, Nevada. According to Jill Abelman, the principal designer of the team, “Your quality of life and happiness go hand-in-hand with a well-designed space. When you are comfortable in your environment, you feel better equipped to meet life’s challenges.” We love the sentiment in Jill’s words. Corey Klassen (@coreyklassen) – Corey Klassen is a well-known bathroom and kitchen designer of the Vancouver boutique Corey Klassen. He is a Certified Kitchen Designer and a Certified Bath Designer. The boutique has been offering Residential Interior Design since 2005. The firm offers a three-in-one design approach, including kitchen design, bath design and interior decorating. Corey Klassen handles custom homes, renovations and creates cohesive designs. Life in Sketch (@lifeinsketch) – Life in Sketch is an interior design blog where editor Tina Ramchandani shares her design ideas, information on products and tips for decorating. Tina has a BA in Interior Design from The Art Institute of Philadelphia and has worked in commercial and residential design. She is the owner of Tina Ramchandani Creative in New York, New York. Check out her blog for her weekly/monthly columns. You can follow these five on their Instagram profiles; their Instagram usernames are next to their names in the parenthesis. Check them out for design ideas, inspiration and tips. This entry was posted in Kitchen Design and tagged design, instagram, interior, interior design, kitchen on August 11, 2014 by editor.